OMG! I am still breathless, when I think of last week. I WAS IN NORWAY VISITING BIBI LINDAHL OF RUBBER DANCE!!! Many times we talked of how nice it would be coming together and we were making plans and dreamed. After many dreams my desire became stronger than my laziness and I bought myself a ticket and took off. To Norway, where I wanted to go to for so many years! Now I did it and I really felt a dream come true. I am in contact with Bibi Lindahl for some time and got to know her quite well, but meeting in person is something else for sure. Being a designer for her Rubber Dance stamps gave it an extra interest to see the place where she creates all these lovely things. We decided to make a spread for WOYWW and also show a shot of us in the studio (hm, we both don´t like to be photographed). You can easily see, that we were busy during my visit! 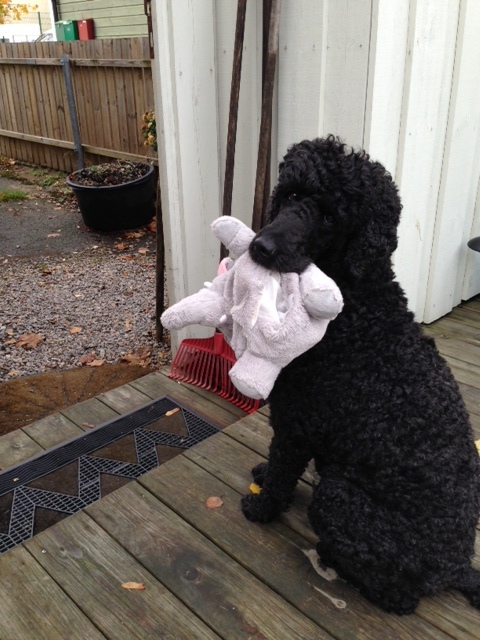 Ulla, Bibi´s darling poodle was always a nice companion. 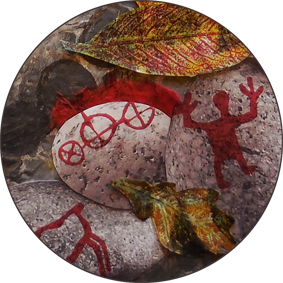 I always loved these prehistorical forms, figures and runes and liked to incorporate them into my paintings. You can imagine how happy I was, that Bibi wanted to show me a rock carving site near her town, called Begby. So we met with her friend Minna and Minna´s daughter Linn, who was taking some of the photos. Come on a walk with me to explore these wonderful carvings on a lovely sunny day! I found some pages in the net about rock carvings in Norway, the best one is in German, sorry. But I am sure, now that you know it, you can find some yourself. But the biggest surprise was that Rubber Dance has a sheet of stamps showing the rock carvings! How cool is that!!!! 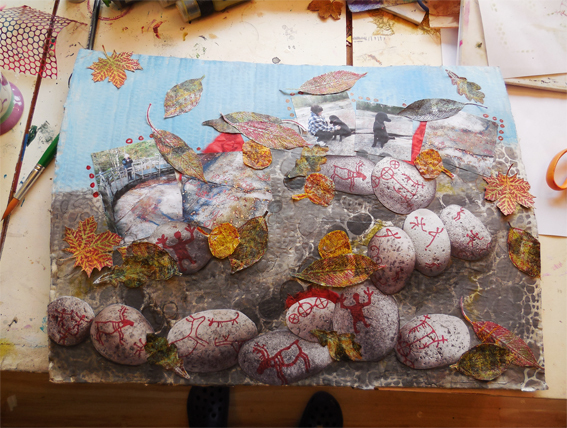 Of course we had to make a spread with just that and also use the stamp leaves, because there were many autumn leaves on the rocks and it went together so well. Here you can see the Rubber Dance – Art-a-tag cooperation! Don´t these leaves look just real? They are stamped on mono printed delicate paper and cut out. I looove this page. 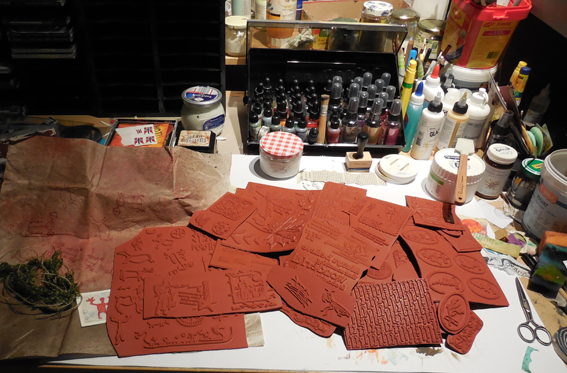 The background is created with acrylics and as stamping on that corrugated cardboard is not easy, Bibi stamped the carving images on rock photos. To see the complete sheet of these brand new stamps just click right HERE. The link is http://www.rubberdance.com/sheets.html. These stamps are so unique, I cannot wait to create some art with it. Bibi made some wonderful wrapping paper and a tag. 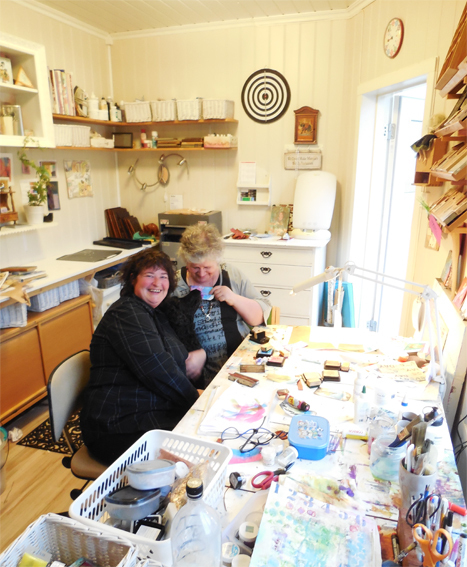 One thing I now know for sure – my stampers heaven is in Norway!! Oh! I almost forgot (how could I!) I must go back to Norway! Ulla is waiting……. 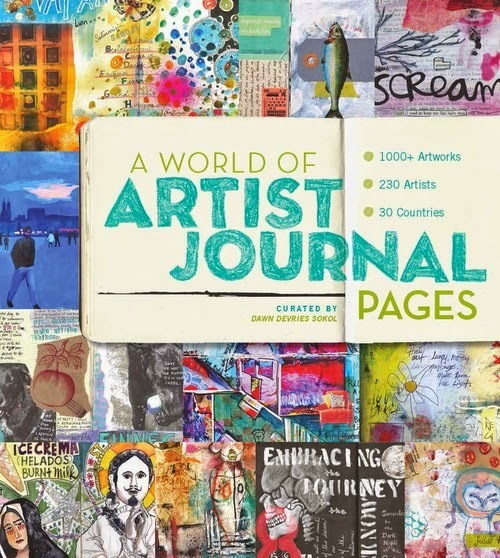 Dieser Eintrag wurde veröffentlicht in art journaling, Rubber Dance, WOYWW am 22. Oktober 2014 von art-a-tag. Bin schon gespannt auf deine Kreationen mit den neuen Goodies! What a fabulous post Gabriele, thank you for sharing some of your time with Bibi. I know exactly how exciting it is to finally get together with a blogland friend after my visit to Wales last week with Wee Man to meet Helen of helencrochet1. It is fun isn’t it. I actually thought you were in NOrway already lol. Where are you? What a cute doggy! That must have been one big adventure – a new country and seeing an internet buddie for the first time. Wow, sight seeing and crafting! Oh how wonderful to meet a blogging friend for real…..and in Norway 🙂 Gorgeous photos of a very special time together. ps yes I use my sewing machine like a pen and simply draw the images on the fabric free hand 🙂 have a go…it’s fun. What fun!! Thank you for the pictures of you, Minna and Bibi. It’s great to finally see you. Cool new stamps. 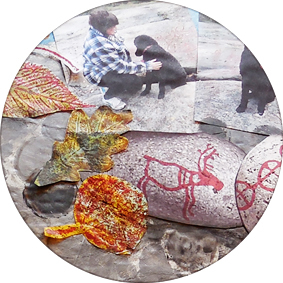 Your trip to Norway sounds great fun, you look as though you both had a wonderful time and created some amazing artwork. Thanks for popping by earlier. It looks like you had a great time. I enjoyed looking at all those photos. The stone carvings are awesome! Ulla looks like she wants to play…. WOW wow wow Gabriele!!! That layout is AMAZING!! You guys did a gorgeous job on it! And thanks for showing all the other pics too…super interesting! das war sicher super schön, danke für den großartigen Bericht! Wow, what an amazing post and those rock carvings are amazing. Norway is one of my dream holidays and lovely to visit via a woyww post. Have a lovely week. What an unusual post, Gabriele. I am glad you had such a great time in Norway, and those stamps are amazing. What a great idea! The page is superb. I’ve just been making autumn leaves too! Thank you for your visit and your lovely comment. Beatrice does seem better now the antibiotics are working and she’s eating better, but was sick again today… We can’t seem to get on top of the infections once and for all, and she has a very delicate stomach. The food you mentioned for sick kitties sounds very good – we might have to try that! Meantime she has her special cat food and fresh fish which she enjoys. What a lovely time you had with Bibi in Norway! I was lucky enough to win some of her lovely stamps, but you probably saw them on my desk 🙂 I would love to visit Norway … some day. Bibi’s dog is absolutely gorgeous, isn’t she? 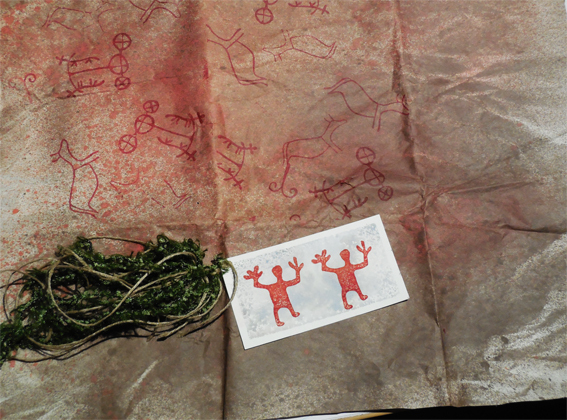 Got lost in Norway’s rock carvings for a bit and then got distracted by the pile of rubber on your desk… I don’t have a fetish but so many stamps make me swoon! Sound like you had the best time in Norway with Bibi! Great post! And all that wonderful rubber as well. I am so jealous.